Apologies, this is slightly wonkish....one of the puzzles of the current economic recovery is that labour productivity appears to be falling. This just isn't what we would expect to happen at this point in an economic cycle. Yes, we do expect it to fall substantially in an actual recession: employers lay off workers more slowly than output falls, meaning that each worker is producing less (the reason for the slowness of the layoffs being that firing someone now and rehiring in the good times costs money, there's stickiness in what happens here). And productivity we expect to grow strongly in the early stages of a recovery as people sweat that labour they've got as output increases rather than immediately going out to hire more people. So we can happily explain much of what's happening in that chart using our standard assumptions. Then we get to 2011 and beyond and we're not sure what is happening there. We really don't expect to have falling labour productivity at that point. So what is happening? We can't tell you exactly and precisely what is happening here: we can't even tell you how important this next point is to what is happening. But we can tell you that this is absolutely one of the things that is going on. Public sector wages are falling relative to private sector ones. That is part of the cause of that fall in labour productivity. Here we enter a rather Alice in Wonderland area of economic statistics, the measurement of public sector labour productivity. In the private sector this isn't actually easy but it is at least logical. Stripped to its essence we add up the value of what is produced, look at the number of hours of labour required to produce that and divide one into the other. If there's more production from the same number of hours then labour productivity has risen. Obvious, really. The important part here being that that "value" is "at market prices". But we cannot use this method for estimating public sector output. Because most of what the public sector does doesn't have market prices: how can we "value" the output of a diversity adviser? Therefore we don't even attempt to do this. The output of government is defined as what we spend in order to gain this output. Thus public sector labour productivity is equal to, exactly the same as, the wages we spend on public sector labour. This has, obviously, perverse effects. If we pay a nurse £25 an hour then we record her output as being £25 an hour. If we double her wages to £50 an hour then her output doubles: even as she ignores the same number of patients to do her paperwork. And note what happens to her productivity: it's just doubled just because we are paying her more. There is no difference whatsoever in the output: but because of the odd way (through necessity) that we measure labour productivity in the public sector that productivity has just doubled. This effect will also obviously operate in reverse as well. If we cut public sector wages then we will be cutting public sector productivity. It might be that we get the same actual output in terms of government from those newly more lowly paid civil servants. And that would normally be regarded as an increase in labour productivity: we're getting the same output for a smaller input. But this method we use to measure public sector labour productivity means that we actually record the opposite effect: lower public sector wages means we are spending less on government and thus we record that value gained from that labour as having fallen. We record labour productivity as falling when we cut public sector wages. And we can look in more detail here (page 19 of the .pdf on that page). By the (controversial) way that ONS measures public sector pay (controversial because while it tries to measure qualifications, organisation size etc it's not adding in pensions accruals and job security etc.) this was lower than private sector in 2001 or so, grew higher than private through the years of the Brown Terror and now there's a deliberate attempt to manage it down again. Whether you think those actions of the Brown Years, or the current ones, are justified or not is entirely up to you. But the implication of this for our recorded labour productivity figures is that some portion of that growth in labour productivity over the period 2001 to 2010, and some portion of the fall in it since, is simply the result of the boom and then restraint in public sector pay. It is, in short, a measurement fault rather than an actual description of anything that is actually happening to labour productivity. As at the top, we can't tell you how important this is: that would require a great deal more research. We can however tell you that this absolutely is at least a piece of the puzzle. 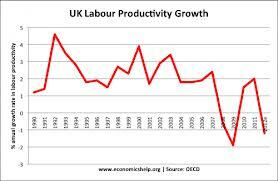 Why is UK labour productivity falling? Simply because we measure public sector labour productivity by the amount we pay them in wages and we're deliberately squeezing those wages currently. My thanks to the prolific commenter Luis Enriques for sparking this line of thought.